One thing that we’ve heard over and over again from The MedTech Conference attendees is that they love the opportunity to consolidate months worth of travel, meetings and logistical coordination into just three days of networking and business development activities. More than one third, or around 1,000, of last year’s conference attendees participate in business development activities as part of their job. 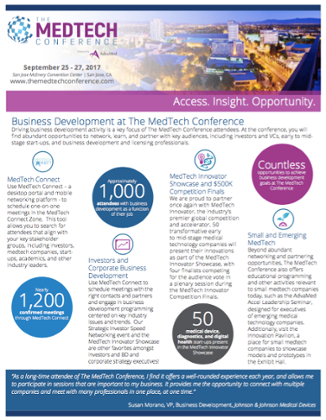 Through our partnering system MedTech Connect, attendees connected and scheduled more than 1,200 meetings - growing new ventures, securing new partners and everything in between. Any questions? Feel free to leave a comment!